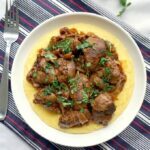 Romanian Chicken Liver and Onions with Polenta, a delicious and easy dish that reminds me of childhood. Packed with great flavours, and highly nutritious, this dish is also toddler-friendly. Low carb, high protein, gluten free. There are so many traditional dishes that make me proud of my background. 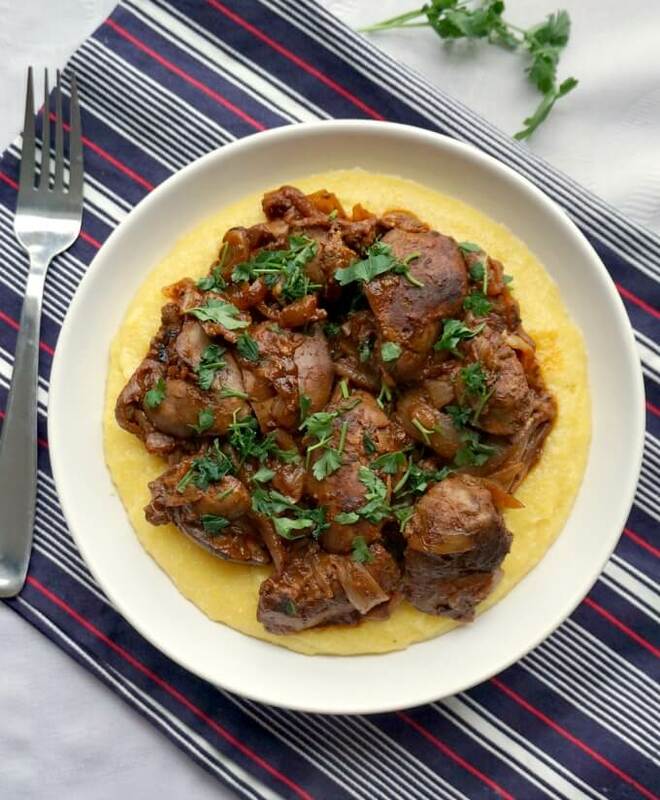 From our beloved Sarmale, to some good old polenta that goes well with pretty much any meat or cheese, or this superb Chiven Liver and Onions, Romanian food is tasty, easy to make, and so full of great flavours. We certainly like meat, much to my (nearly vegetarian) husband’s shock. I mean, we can easily eat meat at every meal, every single day of the week, apart from fasting days, when we are supposed to give up dairy, eggs and meat completely. But, other than that, meat rules. Now, (chicken) livers might not be something many people would be crazy about, and I am fine with that. My philosophy is, you don’t like something, well, just move on onto something you do like. 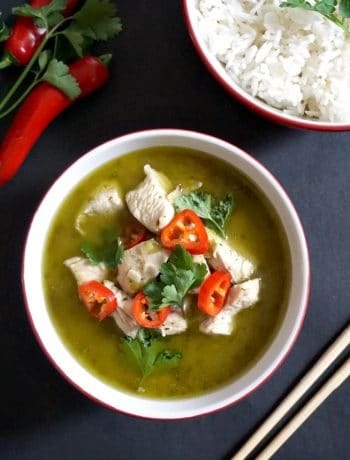 But, if you do like it, this recipe is absolutely delicious. Together with my Quick Chicken Liver Pâté, which is the very best spread you can possibly have, this main dish is absolutely perfect for all the memebers of the family, toddlers (and even babies) included. If you completely leave the salt out, there is no reason why an over 6 month old baby can’t enjoy it too. My little ones certainly loved it, and, surprisingly, so did my husband, who usually prefers to stay away from meat. So, a big winner for us! How do you make chicken liver and onions? First, to get a finger-licking Chicken Liver and Onions recipe is sauteeing the onions first. You can even caramelize them, for extra taste, but just softening should do too. Then, in go the chicken livers, which must be well rinsed before hand. Feel free to remove any fatty bits too. I would personally go for good-quality, preferably organic chicken livers, the better quality, the better taste. Also, the tomato puree can make all the difference in the world, I prefer the concentrated one, it tastes beautifully. Be generous with it, 3 or 4 tablespoons, and you give this dish the finishing touch. Do give it time to showly cook even if the chicken livers look cooked already, you don’t need too much sauce, so continue to cook until it the liquid is almost evaporated and you are left with a thicker gravy-like consistency. My mouth is watering only thinking about it! 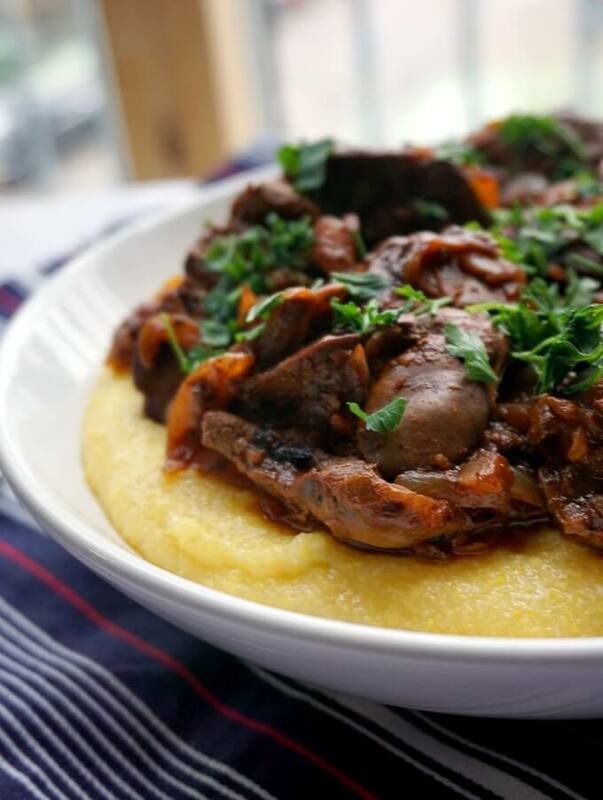 How do you make Polenta to serve with chicken liver? Right, now let’s talk about my ROMANIAN POLENTA or MAMALIGA. I should really have a separate post on it, I have been thinking about it for quite a while, and I should hopefully get there at some point. But for now, I can give you a quick recipe that never fails. The recipe is completely vegan and gluten free, so it really thicks all boxes. 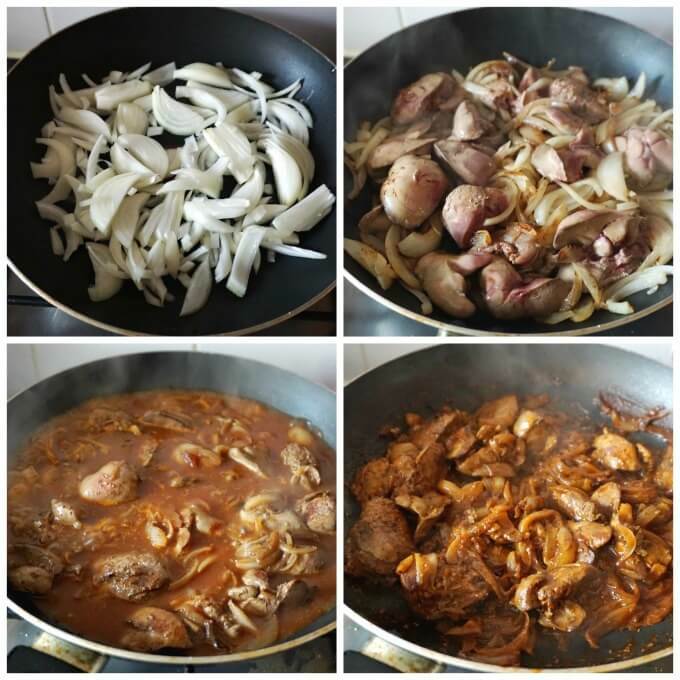 It can successfully replace bread with many dishes, and it give my Chicken Livers and Onions a more traditional touch. You basically need to use 1 part polenta and 4 parts water, then salt to taste, and whisk it on a low heat until you get a creamy consistency. Nothing complicated, but be sure to whisk vigurously to avoid any lumps. And make sure you don’t burn yourself if the polenta starts to bubble. If you’ve liked my CHICKEN LIVER AND ONIONS or any other recipe on the blog then don’t forget to rate the recipe and let me know how you got on in the comments below, I love hearing from you! You can also FOLLOW ME on FACEBOOK, INSTAGRAM and PINTEREST to see more delicious food and what I’m getting up to. 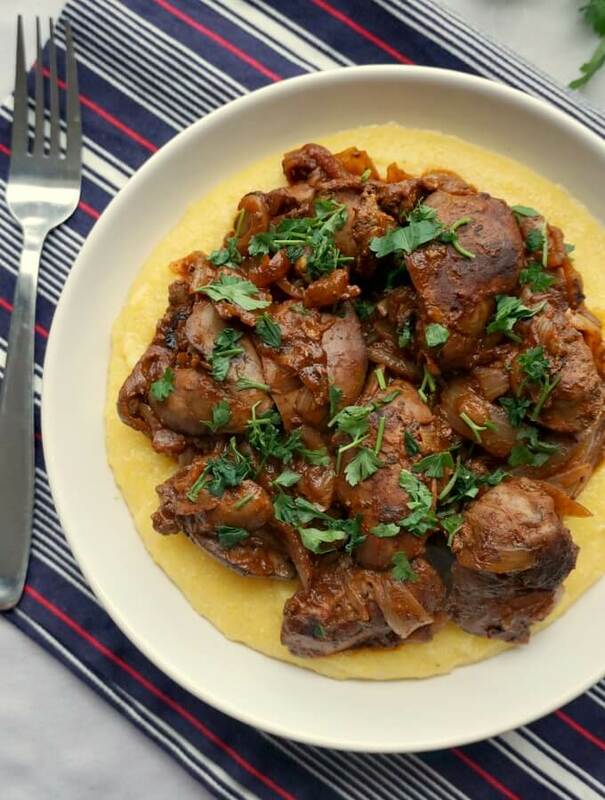 Romanian Chicken Liver and Onions with Polenta, a delicious and easy dish that reminds me of childhood. Packed with great flavours, and highly nutritious, this dish is also toddler-friendly. Peel and finely slice the onions, then heat up the oil and sautee the onions until soft. Rinse the chicken liver with plenty of cold water, then add them to the pan, alllowing them to cook for about 10-15 minutes, until they change their colour. Add the chicken stock, salt and tomato puree, and leave to cook with the lid on on a low to meadium heat until the liquid is almost evaporated into a thicker gravy. To make the poleta, bring the water to a boil together with about a handful of cormeal and the salt. Once the water reached the boiling point, use a whisk to quickly stir, while adding the rest of the cornmeal. Cook on a low heat, whisking for about 15 minutes or until the cormeal thickens and has a creamy consistency. I used to eat this dish when I was a child and I know its really delicious! Thank you! It’s a very delicious dish, and l love it!